When Susan first approached me about the possibility of creating a set of abstract paintings for her dining room, I was thrilled. Not only was it an exciting opportunity to create a larger work, but Susan herself is extremely creative, so I knew she would have lots of interesting ideas for the paintings. I wasn't wrong. Often I look to my environment for painting inspiration (such as my breakfast! ), but Susan actually picked out one of my favorite paintings as a starting point: Geometry of Arrows. She was drawn to the colors and simple geometry of the piece, perhaps because of her interest in quilting. 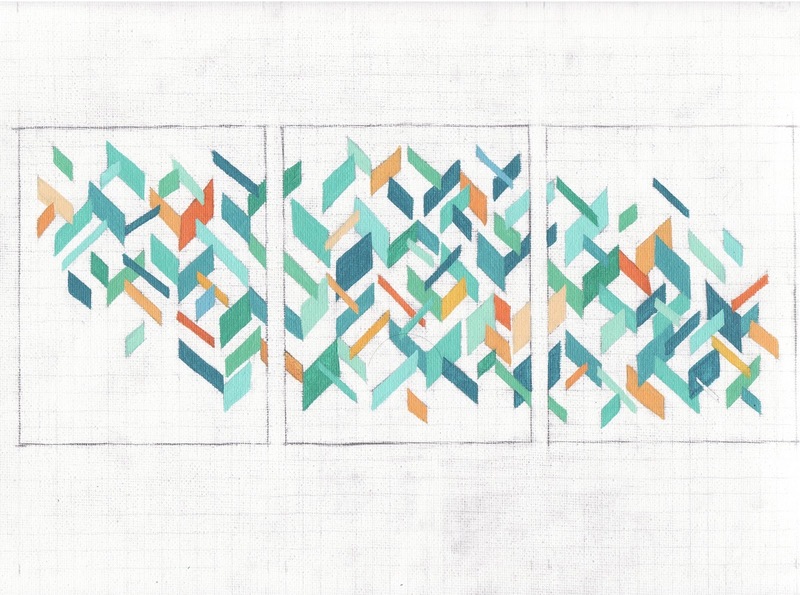 I got straight to work creating some sketches of other geometric compositions. These are actually just our three favorite compositions -- I kind of went nuts on this stage! I loved doing this painting and I hope to use some of the unused sketches as a starting point for future paintings. 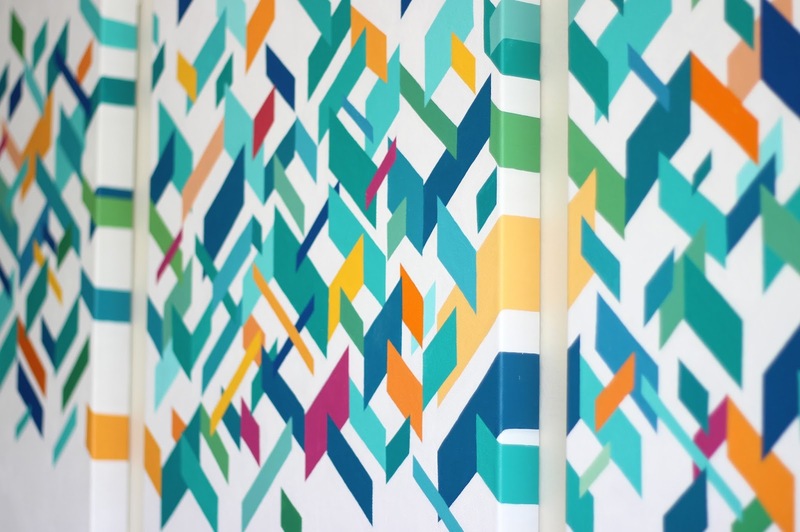 We originally thought we would pick three separate patterns and create a series of paintings that could fit together. However, after I experimented with a deeper-edged canvas that allowed me to paint around the edges of the piece, we decided to choose one pattern that could flow across all three canvases. Next we choose a color palette that incorporated a lot of secondary colors -- Susan is a wonderful gardener and very drawn to greens -- and I created a miniature painting on a piece of canvas. I did about three layers over each painting, working on the shapes, colors, and composition. 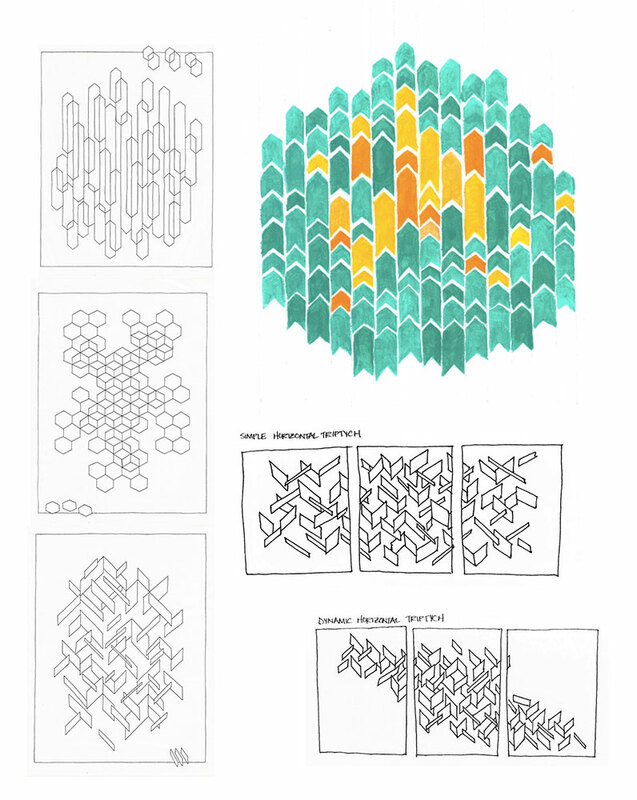 This process felt almost meditative somehow, and I barely noticed the time passing as I worked through each stage. It was almost a surprise to me when it was finished. Working on a commission piece was very different from my usual style of painting. I was much more meticulous about how I progressed and collaborating with someone else forced me to really honestly evaluate each stage. One of the best parts for me was getting to see the space where the paintings would live, and tailoring the piece to its future environment. I think the painting is all the better for it. If you're interested in commissioning a painting, I'm currently accepting work for May. Just send me a message -- I'd love to work with you!